Amanda Buckner is the owner and operator of Amanda’s Glass Art, LLC. Amanda is a native of West Virginia and has a long history and fascination with art that dates to her earliest years as a toddler. Raised in a family of artists and craftsmen, art was always encouraged even at an early age. "My grandmother was an accomplished author and my grandfather was a skilled woodworker. I plan to become a skilled and accomplished glass artisan." Amanda won her first art contest at the age of six in a Stone and Thomas Department Store coloring contest. She went on to win a number of other art contests in a variety of different mediums ranging form paper collage in middle school to charcoal in high school to multi media in college. In 2002 Amanda graduated from West Virginia State University with a Bachelor of Arts Degree in Art, majoring in Drawing. Shortly after graduation she began working at the Avampato Discovery Museum in the Clay Center, a local museum in Charleston. That is where she met Martina Huson, a veteran stained glass artist who offered to hire and train Amanda in stained glass artistry. 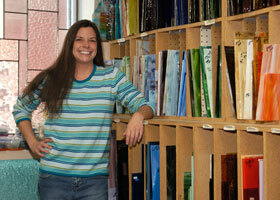 Amanda began working for Martina's Glass Studio in 2004 and discovered her love for stained glass. "I have been an artist all of my life working with many art mediums. Stained glass is one medium that I never used until I met Martina. I quickly learned that glass is the most versatile art medium I have ever come across. Once I discovered this, I never looked back." During her employment at Martina's, Amanda learned the intricacies of stained glass artistry from the basics to complex design and technique. In 2006 Amanda Buckner became a sole proprietor and began selling her own custom stained glass to Tamarack and private residents. In March of 2007 she bought Martina's Glass Studio and opened a Limited Liability Company of her own renamed Amanda's Glass Art. Amanda soon discovered that creating works of art in stained glass presents a realm of possibilities, from glass windows to jewelry to functional pieces and the list goes on and on. She enjoys sharing her glass knowledge with others who are eager to learn through teaching glass classes at her studio. Amanda loves her trade and intends on designing and constructing stained glass art for the rest of her life. "I am proud of my West Virginia heritage and I will support my community and state by maintaining a small business staffed with local employees and by continuing the tradition of handcrafted glass in West Virginia."